On the right and bottom how the APC SmartUPS 1500 looked before cleaning. 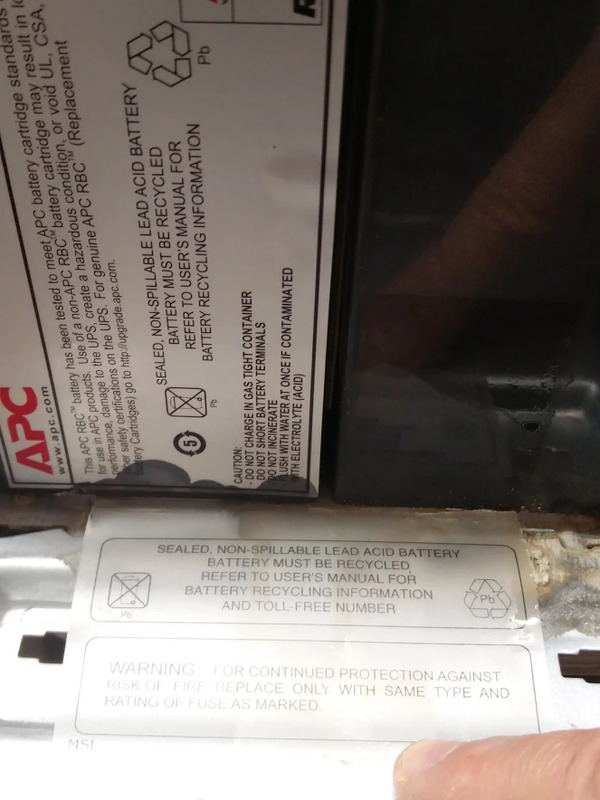 Despite APC claims of being non-spillable, lead acid batteries do eventually leak. APC just doesn’t tell you when (they say there is some fine print about replacing them, but hey – if the UPS doesn’t complain about capacity loss…). Like I mentioned in my first post about the leaking, I cleaned the inside with sodium bicarbonate (easily to get – even in The Netherlands – as “baking soda” or “zuiveringszout” in most grocery shops. “zuiveringszout” is the same but much cheaper). So after cleaning, you need to assemble a new battery pack and reinstall it. The RBC7 stock battery packs from APC are very expensive and since warranty expired on the UPS and APC batteries leaks anyway, it is much cheaper to re-assemble your own battery pack from a pair of UB12180 batteries. The same holds for the RBC55 (which are just basically two pairs of assembled UB12180 batteries). The decoding of these battery numbers are fairly easy: 12V holding 18.0 Ah of charge. Different battery manufacturers use different battery size nomenclature usually with a similar structure. Disassembling and re-assembling the packs is fairly easy. Be sure to do this carefully: replacement sets of the APC battery connector wiring harness and fuse will set you back another USD/EUR 15-20 excluding shipping. The below youtube videos are much clearer on this than any picture series I could have made. and 4 model RBC55 batteries in the SUA48XLBP. But: according to APC, these are leak free. In practice they aren’t, so why pay the APC premium price? It’s much cheaper to remove the head and terminals, then use standard batteries. I was lucky enough that both the RBC55 and RBC7 internally use the same UB12180 battery packs: APC Generic Replacement Battery Cross Reference Lookup is an excellent reference on that. UPS Batterij Vervangingsset RBC7 (Excl. Kabels) (RBC7-PACK) – ReplaceDirect.nl at about EUR 110. UPS Batterij Vervangingsset RBC55 (Excl. Kabels) (RBC55-PACK) – ReplaceDirect.nl at about EUR 220. You can also create your own sets of individual UB12180 batteries. Be sure to get the ones with T4 nut&bot terminals. Forget about the ones with M5 threaded terminals (that often are slightly cheaper). From the same Dutch seller: UB12180 Loodaccu 18Ah – ReplaceDirect.nl at about EUR 55 each. I tried updating my downloads for my APC7920 and APC7921 PDUs. I knew the APC download site http://www.apc.com/nl/en/tools/download/index.cfm was slow and navigation unfriendly (lots of ERR_CACHE_MISS as you cannot ctrl-click on downloads), but it’s also buggy: Some of the ftp download URLs do not contain the authentication and one file would not download at all. The username is restrict and the password Kop$74! which requires single quotes on the command-line to prevent parameter and event expansion. Otherwise you will get bash errors like these: event not found for the part starting with an exclamation mark and Login incorrect. for the parts having a dollar. specify the -G (or –get) parameter forcing GET behaviour (which should be the default). I’m not sure why it works, but it does. I’ve had a SUA3000XLI for years using the USB cable and default Windows support as PowerChute Personal Edition would fail to recognise it and abort installation (so I could not use APC drivers as described on youtube). A while ago, Liander – the energy distribution company – wanted to replace both the gas and electricity meters to become “smart” during day time. The server configuration load was heavy enough for Windows to indicate the UPS would last about 30 minutes. At night that’s not much of a problem but during 1 hour replacement day-time it would be a problem. So I bought a SUA48XLBP battery pack (and a SUA039 cable as the cable wasn’t long enough to keep an inch or so air space between UPS and battery pack) so the battery would last about 3 times as long. Windows would still show it would last about 30 minutes. Strange. So I started looking around and it appeared the SUA3000XLI needed calibration which requires PowerChute. Since PowerChute won’t work, I was almost back at square 1. Almost, as I know knew it required calibration. In the past I had come across apcupcd but that was a long time ago when it supported a limited set of operating systems and a limited set of features so I never installed it. But when searching how to calibrate the without using PowerChute, it quickly appeared that the apctest part of apcupsd can do just that: soft calibrate the UPS/battery combo. There are some steps and prerequisites (the most important ones are to turn off the apcupsd and provide enough load and 100% battery charge at start). Spoiler: the combined UPS/battery-pack now lasts for almost 2 hours which is long enough.